My article on a new campaign to promote local farmers and ranchers who raise their animals on grass publishes online today in the Oregonian's FoodDay section in an article titled, "Farmers make the case for pasture-raised animals with Pro-Pasture Fridays." 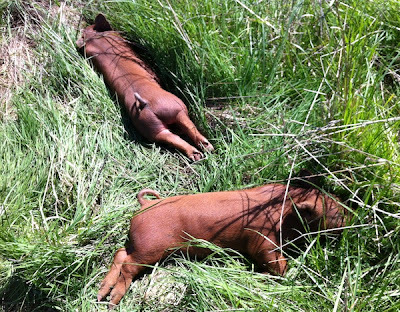 And yes, that's my photo of cute piglets napping in the grass (above) adorning the article! 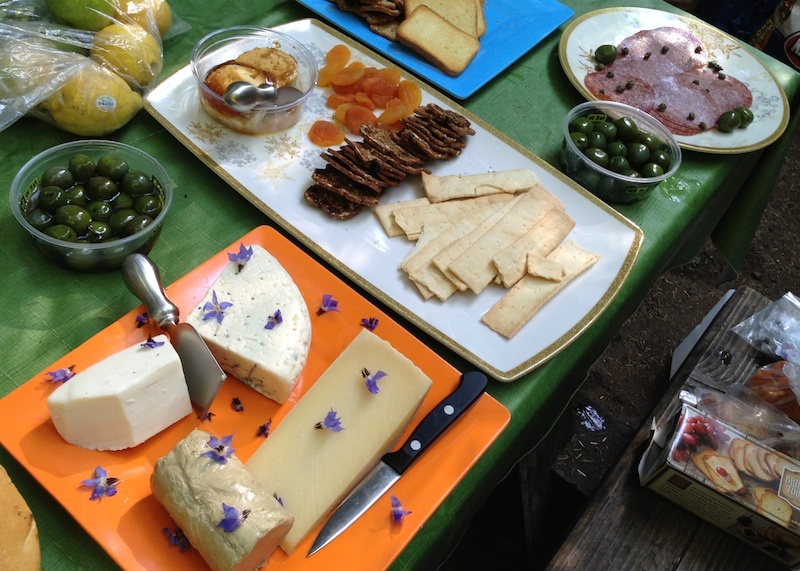 This bulletin from contributor Anthony Boutard of Ayers Creek Farm is a must-read for those of us puzzled when fruit goes bad in the bowl. I stand before you chagrined at my ignorance. Nicely groomed and ready to yield us her fruits, the field looks beautiful. It is a farmer-ish thing to have one eye on the current harvest and the other on the primocanes that will produce fruit next year. They are strong and growing vigorously. Last year, a frost in mid May killed the first flush of primocanes and we will have a lighter crop as a result. 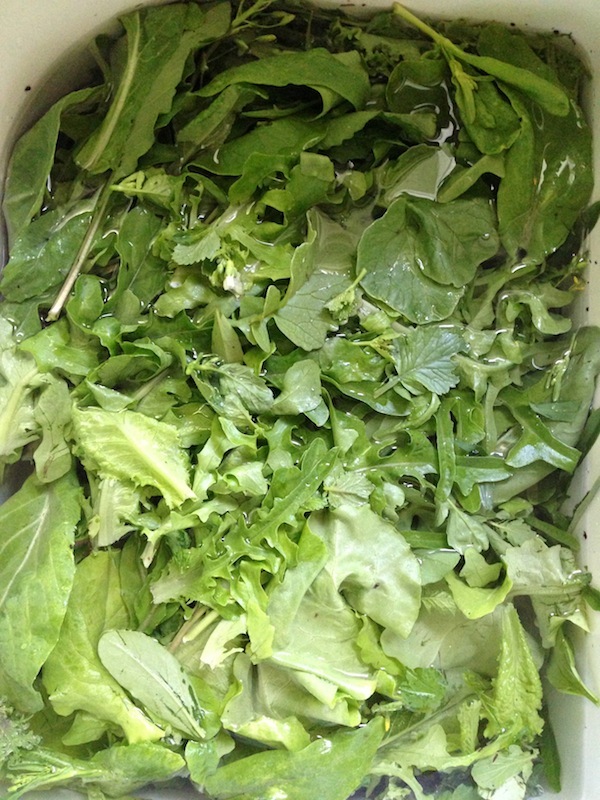 In the swirl of dust and pump drama, we sowed the the chicories, escaroles and other cool season greens. The storage of fruit is worth considering. In our industrial age, the tendency is to jam it in a refrigerator set at a temperature best suited to storing meat and dairy products, under 40°F (4°C). This temperature damages the fruit. 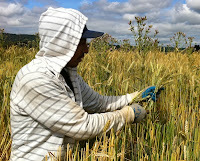 The better temperature is around 55°F (13°C), the night-time temperature in the field. The primary spoilage factor in fruit is moisture, not heat. You can dry fruit to preserve it, but if it rains for an extended time, the fruit is soon a moldy mess. True, refrigeration cans slow the progress of spoilage organisms, but at the expense of flavor and aroma. If you want to store berries for a week, it is better to put the fruit into a freezer immediately. Fruits are best kept in a cool, dry room with good air circulation. Put them in a wire mesh colander, not a bowl or plate. Unlike meat and dairy products, fruits are living tissues and they are respiring. If you put your cherries in a bowl, the moisture generated by respiration collects at the bottom of the bowl and the fruit starts rotting from the bottom up. In a colander, the heavier, moisture-laden air can drain away. We store tomatillos, harvested in September, until March stored in this manner. Peppers, tomatoes, plums, melons, squash all store better at a moderate temperature provided they have never been refrigerated. Peppers will last several weeks on the counter. Our fruit is brought from the field to a cool, dehydrated room with a fan running to keep the air moving. Overnight, the dehydrators draw from the air between two and five gallons of water, depending upon how much fruit we harvest. As long as there is no free moisture on the fruit, and no existing mold, they will not mold. This gentle treatment maintains high fruit quality. Because the fruit is not chilled, when we bring it to the market, no condensation is formed on its surface when it meets the warm, humid air. This early season fruit is the sturdiest and most intense. It has the highest levels of pectin and acidity, and is well constructed. If you are making preserves, this is the fruit to use. As the season progresses, the pectin and acidity levels drop. Because pectins can mask some of the components of flavor, later season fruit has a different character. For some, the reduced acidity makes the late fruit sweeter on the palate even though it has lower sugar levels. 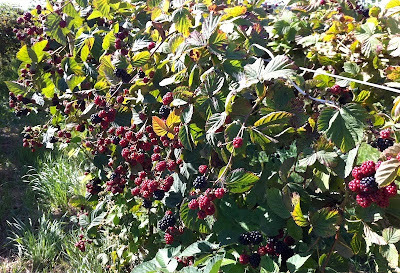 Many of you have heard our warning as the harvest of a fruit winds down: it is more delicate now and won't store well. For the Chester that warning will come about five weeks from now, or following a rainy period. Farming, as contributor Anthony Boutard of Ayers Creek Farm, reminds us, is not all the gentle art of sowing seeds and waiting for them to break forth from the soil. 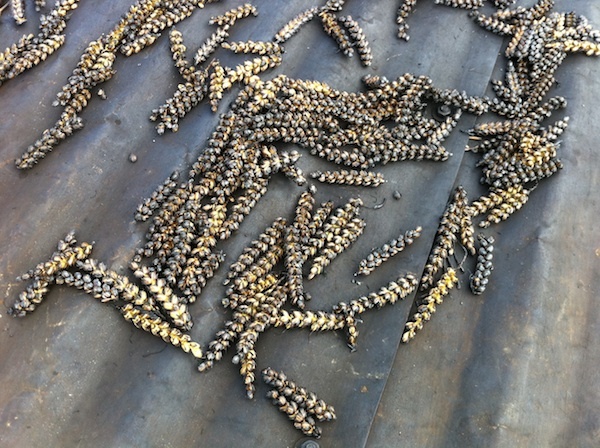 Sometimes the whole harvest can come to a screeching halt when a mechanical part decides to have a meltdown. High summer is the season of dust—the wind, the combines, the plows and traffic all keep the air well endowed. Even walking across the field sends up clouds. It penetrates the clothing and clogs the nasal passages. 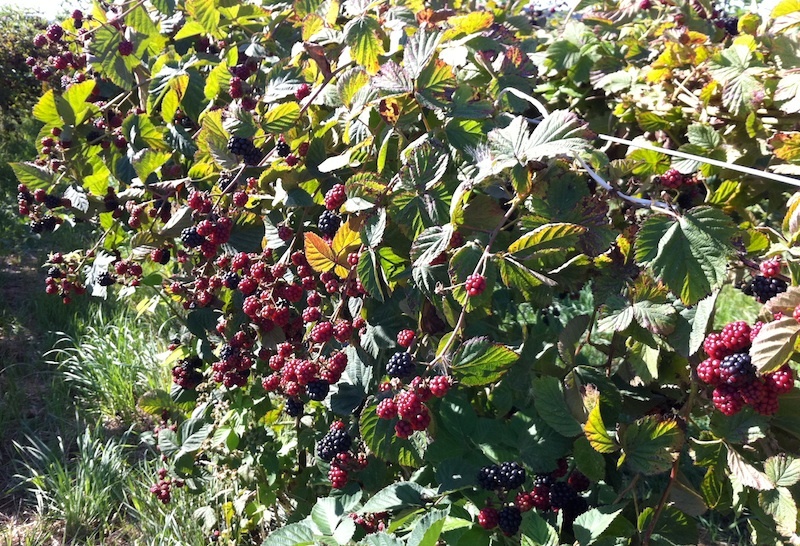 Every year, as the main berry season approaches, we order in three or four truckloads of crushed rock to dress the road from the field to the farm buildings. This fresh band of rock helps reduce the dust when we bring the berries to the packing room. The new pump installed…Anthony would have preferred claret or lime, but gray is all they had. 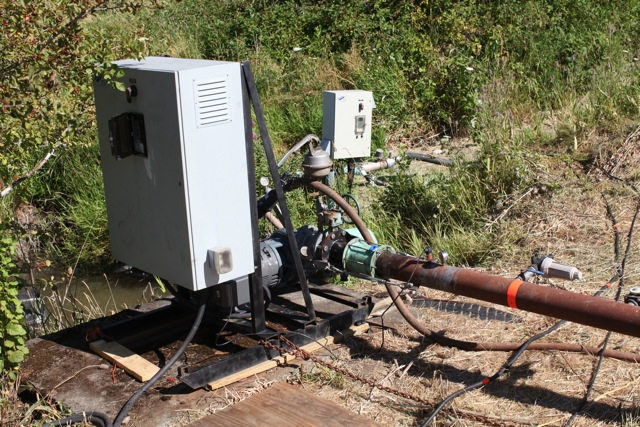 Thursday we set up the 50 horsepower pump (top photo) in case we need to increase the humidity the field so as to prevent damage by ultra-violet radiation when the field temperature passes 90°F (32°C). It ran for a few minutes and then we got the dreaded ALARM 14 EARTH FAULT on the variable frequency drive, the pump's brain. The drives were programmed in Denmark so they use the British term for the ground. We battled this problem last year, but it was erratic and the resetting the computer worked. This time the gremlin settled in and resetting did not work. We spent a couple of hours troubleshooting the problem with the electrician on the phone, connecting and disconnecting leads on the 430 volt system. It was not a temperamental drive or a bad cord, the motor was simply toast. 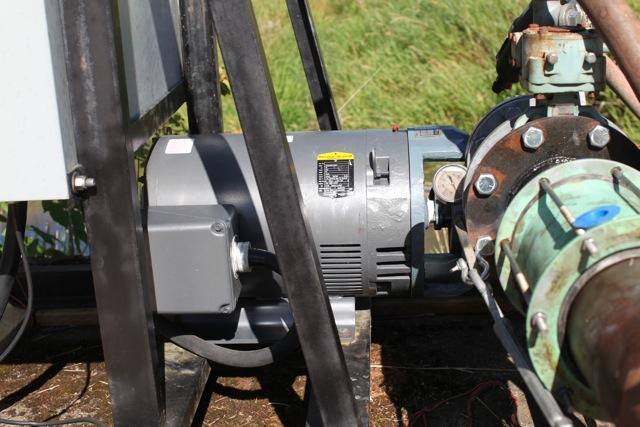 Once again, Ernst Irrigation pulled through and we have new motor on the pump in less than 24 hours after diagnosing the problem. Credit also to our staff who know how to scramble when we need their help, making it easier for the technicians to carry out the swap. zeitgeist: The defining spirit or mood of a particular period of history as shown by the ideas and beliefs of the time. It's something I've experienced before, and it could be a complete coincidence. When I was in advertising, I'd come up with a headline that was so original, so clever, a concept that I'd never seen or heard before. My ad would appear, and then I'd see the exact same concept in an ad for some national product that must have been developed at about the same time I was coming up with mine. So I can only assume that Mark Bittman and I were in the same cultural cloud when we were coming up with our summer recipes this week. His appeared on Wednesday, so he beat me by a couple of days, but I swear on a stack of holy books that mine was in process before I saw his. The spirit that moved the two of us was inspired by the humblest of ingredients, what a writer like Michael Pollan would call the civilizing influence on the human race. Mine was provided by the frikeh I picked up from the Ayers Creek Farm stand at the Hillsdale Farmers' Market, a parched wheat with a faint, smoky essence. 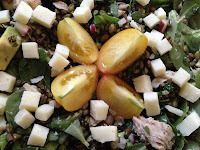 Here is my point: these grains, whether farro, frikeh, bulgur, millet or some other whole grain, are perfect for summer salads. Cook the grain in the cool of the morning, preferably enough to last a couple of meals, then throw it in the fridge to make up later. And I agree with my colleague, Mr. Bittman, that these grains provide the base, the bass note to carry the playful tune played by whatever seasonal ingredients you can lay your hands on, whether carrots, radishes, spring onions, parsley, tomatoes, etc., etc., etc. Mine was an eclectic collection of sweet red spring onions, the very last of the albacore I canned last summer, avocado, chopped parsley, cubed pecorino and purslane. I prefer to dress grain salads with the simplest of dressings, i.e. olive oil and lemon, but you can get fancy with herbed vinaigrettes or emulsions of balsamic and shallots if you prefer. 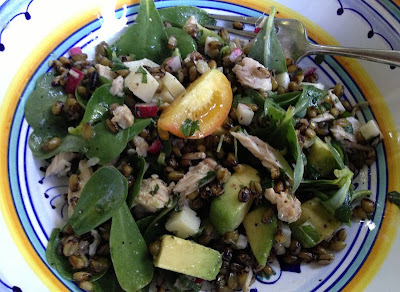 Grain salads are hearty and filling, yet cool and fresh, and definitely fit for company. 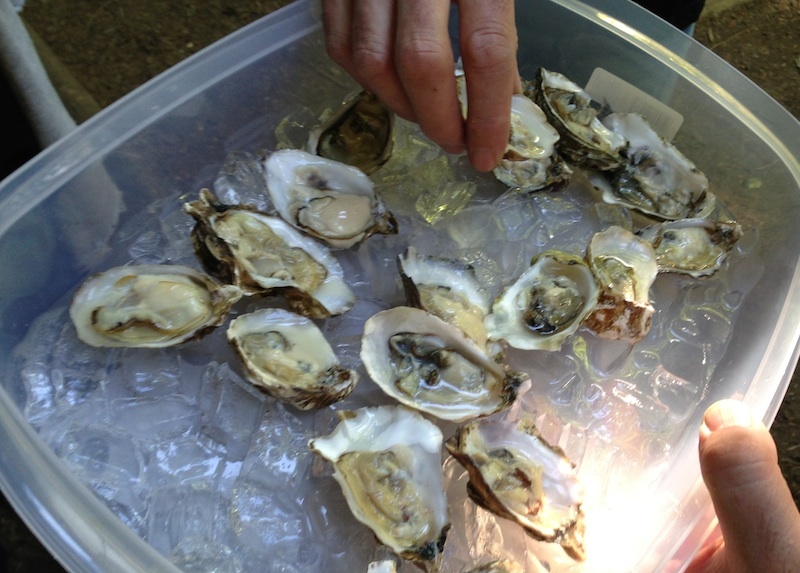 They pair well with a full-bodied rosé, especially served around a table in the back yard with a gentle summer breeze. Get the other recipes in the Summer Salad Smackdown series. Contributor Jim Dixon of RealGoodFood is a griller extraordinaire, and cooks on little else other than his Weber during the summer. 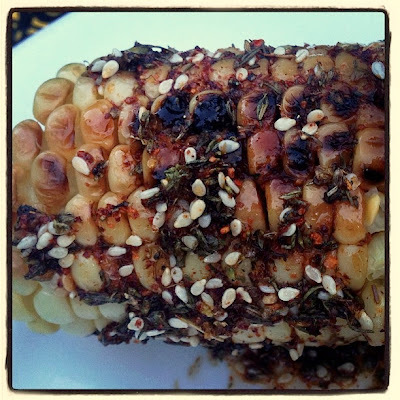 I can tell already that this version of grilled corn is going to be appearing regularly on our summer table. The summer’s heat means fresh corn, and it is a beautiful thing. Most of the corn grown for eating (as opposed to processing) is super sweet, not just a superlative description but a class of cultivars that have a lot more sugar than the older, plain old sweet varieties. It might not taste as “corny” as the sweet, but it doesn’t become starchy so quickly, a tradeoff I can live with since it’s no longer necessary to get the corn cooked immediately after picking. I like fresh corn almost any way, but of course these days I’m cooking it over fire. I shuck the ears and put them right over the coals so those sugars can caramelize. I’ll even admit that most of the time I eat it with butter (sometimes olive oil, but corn on the cob seems made for butter), but I like to mix it up, too, by adding this very simple spice rub. If you don’t have any za’atar in the cupboard, make a batch by toasting some sesame seeds, then mixing with ground sumac, dried thyme and Pantellerian oregano (I mix roughly equal parts, but some folks like more herbs than sesame and sumac). You may also need to drive to Barbur World Foods for a jar of the mildly spicy Aleppo pepper*, or substitute a mild chile powder (not as good, but okay). Mix a couple of big spoonfuls of za’atar with half as much Aleppo pepper, add a little good salt (the Sicilian fine sea salt I have is perfect) and stir in enough extra virgin olive oil to make a thin paste. 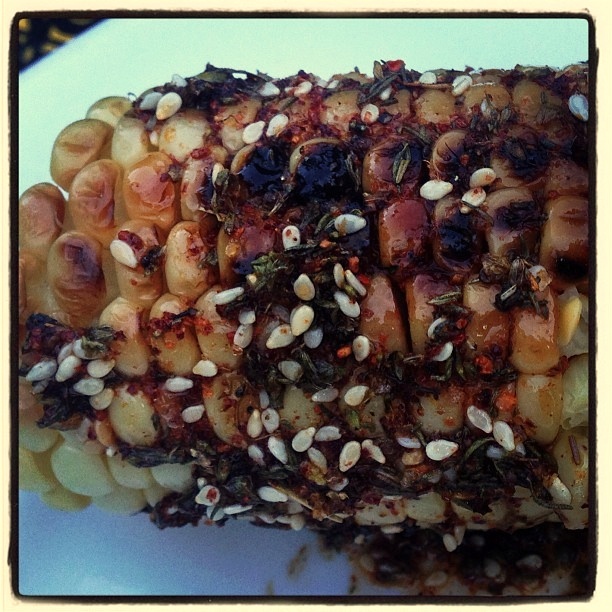 Grill some corn, slather with the za’atar mix and eat. * Aleppo pepper is also available at Penzey's and other stores that carry a wide range of specialty spices. Consider the source: Frank Morton of Wild Garden Seed has been breeding and selecting lettuce and salad greens for decades on his farm near Philomath. He and his wife, Karen, were some of the original suppliers for Genoa back when it was one of the few restaurants in town featuring seasonal produce from local suppliers. Cathy Whims, then its chef, remembers the packages that would arrive from the Mortons. "It was the most extraordinary salad, the likes of which I have not seen ever again," she said. "The salad would come in bags of about eight servings per bag," she said. "The bags would be lined with this beautiful muslin cloth and stamped Wild Salad Mix. There would be layers of 20 different greens that would be stunning, wrapped up like a Parisian chocolate box." Also inside the bags there would be a handwritten key to the varieties of lettuces and greens, along with pictures of the children and of the various lettuces in the fields. The key would be posted in the kitchen so the staff could check it if guests had questions about their salad greens. The photos were posted there, too, and Whims remembers, "We all felt like we were part of this family we'd never met." 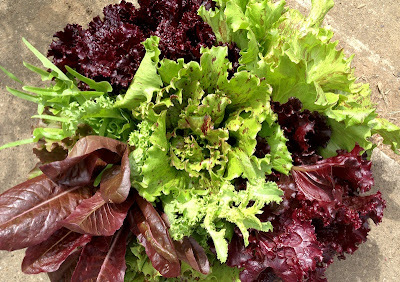 This spring, after I experienced a dismal failure of an initial planting of lettuce seeds from another company (which, admittedly, might have been the result of extremely hot weather right after planting), Carol Boutard shared some of Frank's seeds that she and Anthony planted at Ayers Creek Farm. Those seeds, developed for the climate of the Northwest, have performed stunningly in my garden this year (top photo). While you won't find packets of Wild Garden Seed in stores in the Portland area, you can be sure that next year I'll get my order in early on their website, and look forward to another great harvest next summer. Read the profile of Frank Morton that I wrote for Edible Portland. In Part Two of this Farm Bulletin, contributor Anthony Boutard of Ayers Creek Farm discusses the much-maligned prune and shares a unique way of curing the immature green fruit. 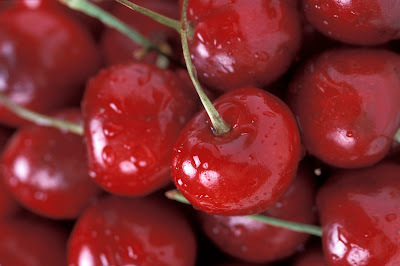 In Part One he discusses the attributes of sour cherries. The stone fruits have three separate layers surrounding the seed and are what botanists call a drupe. The layers are the skin (exocarp), the pulpy flesh (mesocarp) and the hard layer surrounding the seed (endocarp) that the laity call the stone or pit. These three layers are derived from the mother plant's tissues, whereas the seed inside is the result of the sexual union of the sperm produced by the pollen and the mother plant's egg. The various stone fruit have characteristically shaped endocarps. Cherries have round ones, peaches have a large-pitted version, almonds have a softer corky endocarp, and the plums have a very hard asymmetric pit. The seeds have a characteristic bitter almond flavor, and some are toxic when eaten in large quantities. The Boutards have long eaten the seeds of stone fruit without apparent ill effects. In many parts of Europe, it is customary to include some pits to flavor preserves and eau de vies made from stone fruit, just as Sarah [Minnick of Lovely's 50/50] does with her ice cream. 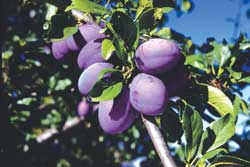 The plums are the most diverse of the stone fruits in terms of types and flavor. This week, we start with a prune bearing the regal name of Imperial Epineuse. The prunes are a class of related plums with a very high solid content of sugars and fiber, which allows them to dry well. They are prunes no matter whether they are fresh or dried. The commerce in dried prunes originated in Hungary in 16th century and spread westwards into France and Germany. The original seedling of Imperial Epineuse was found in an old monastery near Clairac, France. It was introduced to Oregon in the waning days of the 19th century as a dessert prune under the name of Clairac Mammoth, but never gained a following here. Not sure why, as it is easy to grow and more reliable than any of our other stone fruit. A steady cropper, as the Brits would say. The texture is very fine, and pomologists have suggested that it may have a bit of damson in its background. The skin provides a pleasing and contrasting acidic note. If you have an over-productive prune in your backyard, you can pick the very young fruit in the spring, before the pit has hardened, and cure them just as you would olives. The whole fruit is edible, no need to pit them, and you use them in dishes just as you would olives. We crack the fruits with a mallet and put them in a jar with water, changing it daily until they turn olive green. Last year, we cured them in lye. The cured plums look no different than cured olives; the lye cured plums are dark just like lye cured olives. Publication 8267 from UC Davis gives good directions. We got the idea for curing plums from a visiting Chicago Chef Paul Kahan, who served up a dish with green peaches cured in the same manner. Greg Higgins and his staff cured gage plums and seasoned them with a Tunisian accent. That is the great part of having visitors to the farm, they always leave a new idea or two as they depart. 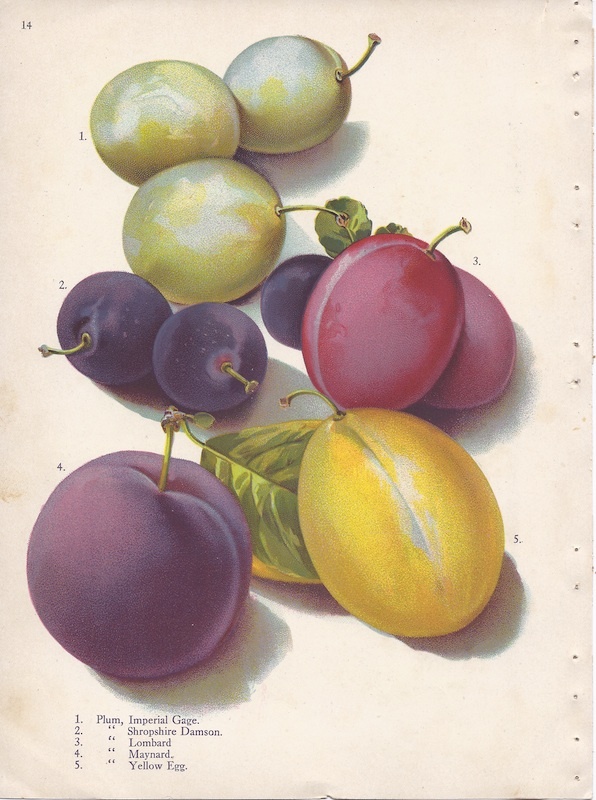 Illustration of plums at left by Alois Lunzer from the Brown Brothers Continental Nurseries Catalog, 1909. Call it vandalism, a political statement or, as the FBI so quaintly puts it, "economic sabotage," but the fact remains that two fields of genetically modified sugar beets near Ashland were pulled up and left to die. A story in the Oregonian by Kimberly Wilson described how discussions between the biotech giant Sygenta and local organic seed and vegetable producers had broken down over details of how a "pinning system," which would have established safe distances between crops that could potentially cross-pollinate, would work. It turns out that local organic growers had been unaware that the biotech company had been planting genetically modified (GM) Roundup Ready sugar beets in Southern Oregon's Applegate Valley for more than a decade. The problem is that the genetically modified beets were being grown for their seed (see the Beet Beat series about a similar controversy in the Willamette Valley five years ago). This means that the plants would produce pollen, which one EU study showed can be carried on the wind as far as five miles from the source, and can also be carried by birds, insects, cars and trucks for much greater distances. 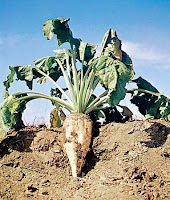 Since sugar beets are a member of the brassica family, their pollen has the potential to cross-pollinate with any member of that family, including table beets, chard, kale and any number of leafy greens. This presents a huge difficulty for organic seed and vegetable producers, who are prohibited by stringent organic standards from selling any products that have been contaminated with genetically modified organisms (GMOs). One organic seed grower that Wilson spoke with for the article, Chris Hardy, said that "in May, he was forced to destroy a crop of organic chard on a quarter-acre field near Syngenta's after a seed buyer balked at the proximity. 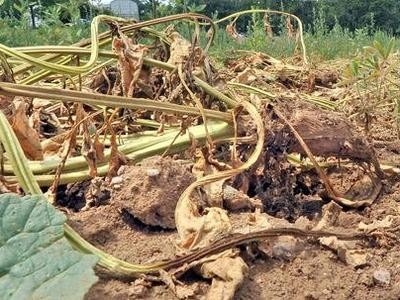 [Certified organic farmer Steve] Fry said this summer he'd tilled under 5,000 [table] beets he'd planted about a mile from a Syngenta field, out of concern" over contamination. Despite these difficult issues, representatives from the pro-GMO and anti-GMO factions had been meeting to hammer out an agreement over pinning their fields, but when it came to divulging exactly where the 30 to 40 fields of GM sugar beets were located, Wilson wrote that "the Sygenta representatives announced the company no longer saw a point in attending meetings and then walked out." Four days later the first field of beets was destroyed and three days after that the second field of beets was uprooted. Federal investigators are asking for the public's help in tracking down the culprits. 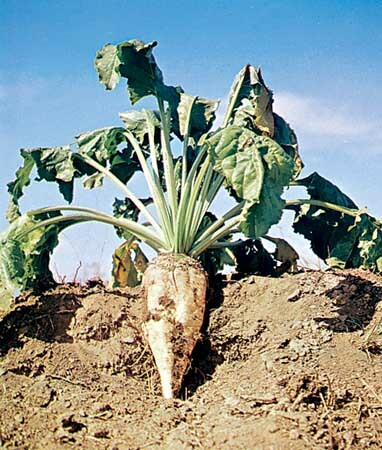 Read the original Beet Beat series about a similar controversy five years ago over sugar beets being grown for seed in the Willamette Valley. Photo at top of sugar beet damage near Ashland from the Medford Mail Tribune (via OPB News). "Don't push the river, let it flow." 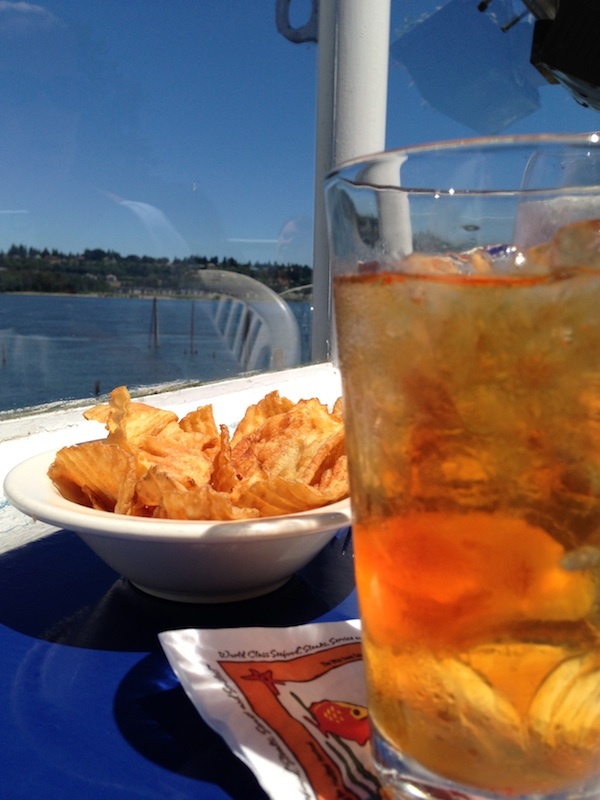 There's nothing better on a summer afternoon than kicking back with a tall, cold drink in your hand. Even better, kicking back with a tall cold drink and a killer view of the Columbia River flowing by. Last week I got a chance to visit two of Portland's best river-viewing platforms, and they couldn't have been more different. 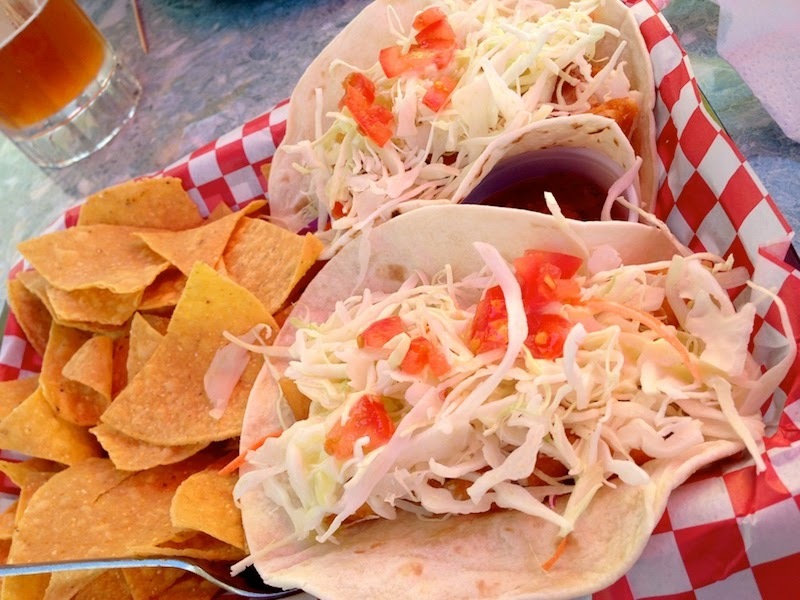 Two happy hour fish tacos. Someone described The Deck "like taking a vacation to Mexico without leaving the city." Imagine a big floating dock set with umbrella-ed tables and a bar at one end, lots of Mexican beer signs and patrons having a great time and you've pretty much got the ambience. It's like dropping in on a dock party, since The Deck is located smack in the middle of a large marina, with boats big and small all around and great water-level views of the working river. Fancy it's not—a roll of paper towels substitutes for napkins—but there's always a breeze, welcome on hot summer days, and there's a shaded canopy section for the UV sensitive. They've got several craft beers on tap, they serve a very fine margarita and their limited cocktail menu is nothing to sneer at. 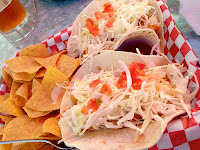 The food is a lot better than you'd expect, too, with delicious fish tacos, a black-and-blue Ahi tuna burger that is seared to perfection, housemade potato chips and an excellent, value-driven happy hour menu that lasts all day. When I ordered tacos off the regular menu, my server said I could get two happy hour tacos for less than the same ones on the regular menu ($11 vs. $11.75). Gotta love service like that! 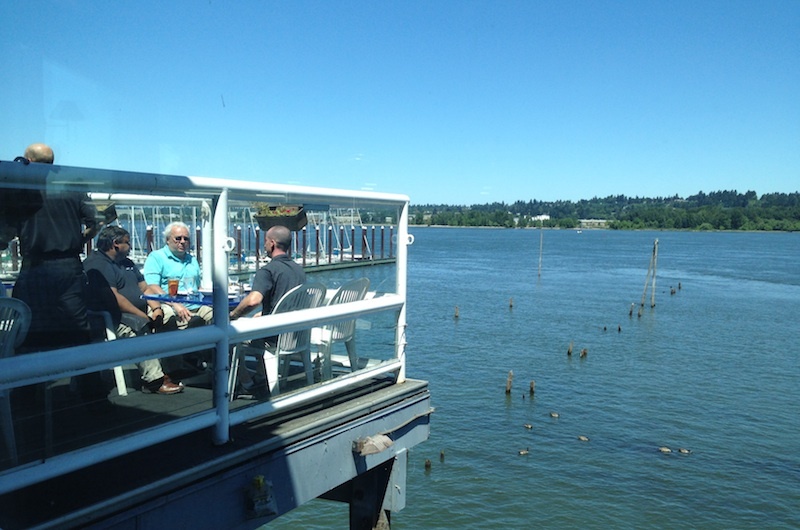 Details: The Deck, 2915 NE Marine Dr. in McCuddy's Marina at 33rd and Marine Drive. Website says "you can come by boat, jet ski, kayak, car, bike or motorcycle. 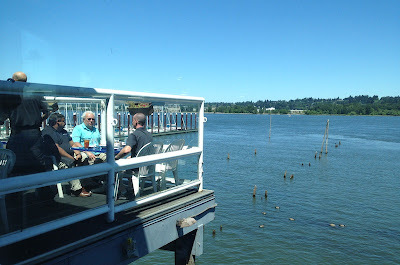 Parking is available in McCuddy's Marina. 503-283-6444. 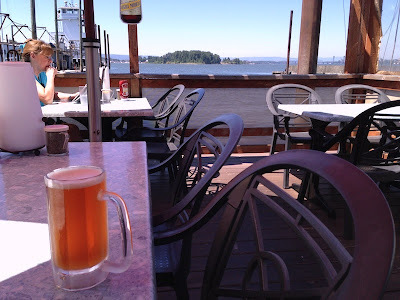 A mere half-mile or so upriver from The Deck you'll find Salty's on the Columbia, another stellar place to hang out and watch the river course by on its journey to the Pacific. But it feels like it's a million miles away in just about every other way. This place is seriously old school…two stories of open windows frame the view, and the wraparound decks—bar above, restaurant below—soar above the river. There are no waves to rock you on this land-based bastion and no breeze will ruffle your hair thanks to the tall glass windbreaks protecting you and your tableware from any disturbance. The cocktails are classics, too, deftly handled and well-executed, but the food, well, the food is what you'd expect from a place that caters to an older, less adventurous crowd. You'll find no fresh-from-the-farmers' market surprises or molecular gastronomic creations on this "waterfront seafood grill" menu. The fish is handled respectfully, though their signature coconut prawns appetizer, breaded, deep-fried, and dipped in grated coconut, can be light and delectable one trip and stale and cardboardy the next. Salads are good if you stick with the classics—my shrimp and crab Louis was a decent version even if the crab was somewhat hard to find. But older relatives, more conservative business types and out-of-towners will love this place and talk for years about the time you took them there. And, seriously, there really is no faulting the awesome views. Details: Salty's on the Columbia, 3839 N.E. 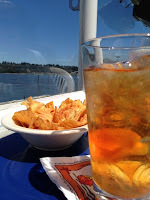 Marine Dr. 503-288-4444. Thank goodness Facebook and Twitter didn't exist when I was a young parent. (For the record, Al Gore hadn't thought up the internet yet, either.) I would have been one of those people posting photos of my kid in his wading pool, grinning after losing his front teeth or making the winning soccer goal. 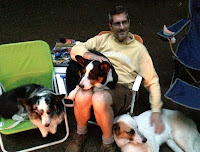 Relaxing by the fire (l to r: Kitty, Walker, Jeff, Hank). 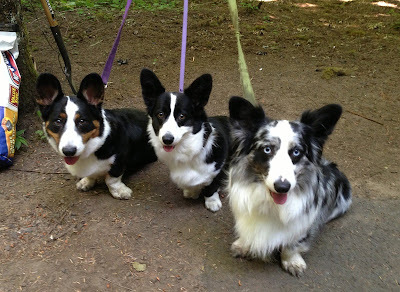 Which brings us to the photo at the top of Walker (left), Kitty (right) and their new friend Thimble (center), who was recently adopted by friends. 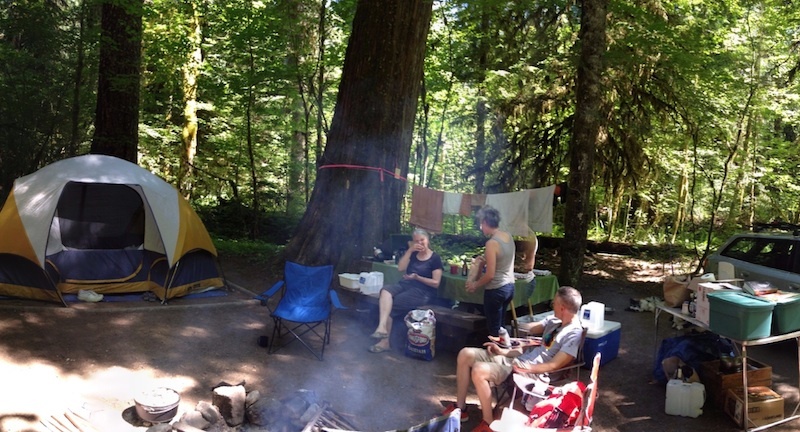 They're pictured tethered to a zip line, a thin rope tied between two trees on the edge of the campsite (and out of reach of any fire pits or tangling opportunities), with their leashes attached to the rope by carabiners. The carabiners slide along the rope, giving them more freedom of movement than they'd have if they were tied to a tree. Plus it's easy to unhook the leashes if (who am I kidding…when) the leashes get tangled. It was a great solution for us (thanks, K!) and one we'll be using on future trips. 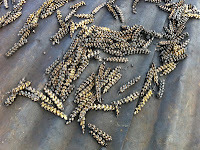 Fifty thousand bees killed in a Wilsonville parking lot. Millions of bees killed in a single event in Canada. All laid to the use pesticides containing a group of chemicals called neonicotinoids, which are used in many commercial sprays and can even be purchased in most hardware stores and nurseries under various trade names. Today Oregon Congressman Earl Blumenauer joined Xerces Society executive director Scott Hoffman Black in introducing the Save American Pollinators Act. The legislation suspends the registration of any neonicotinoid for use in seed treatment, soil application or foliar treatment on bee-attractive plants until the Environmental Protection Agency reviews these chemicals and makes a new determination about their proper application and safe use. The fact that neonicotinoids are known to kill pollinators like bees and other beneficial insects is not news. The European Union banned neonicotinoids earlier this year, noting the chemicals, which attack the insects' nervous systems, could be directly related to falling bee numbers. Neonicotinoids were originally thought to be a "silver bullet" pesticide because they are absorbed into the plant tissues, meaning they aren't washed off by rain and they remain in the tissue for a significant period after application. Unfortunately for the insects that depend on the plants for their survival, the chemicals are also found in the flower nectar and pollen when the plant blooms. 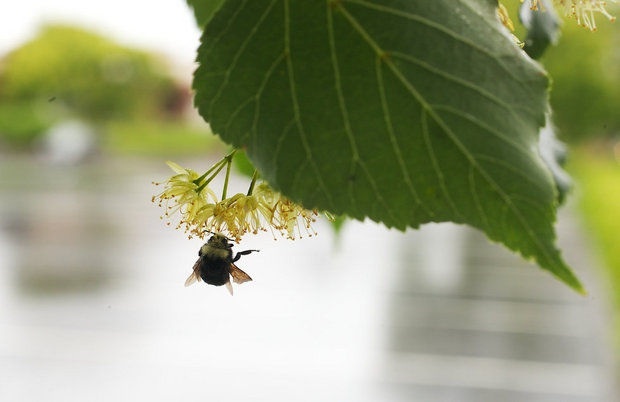 The University of Minnesota’s Dr. Marla Spivak, a leading global authority on bee health, said that in addition, neonicotinoids "are long-lasting in soil and they readily move into water. 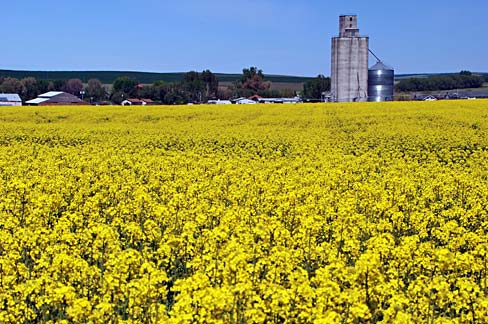 If the Oregon event is an indication of what is happening more widely, we will begin to see catastrophic threats to food security and the pollination of wild plants." The announcement of the Save the Pollinators Act was announced in Portland, Oregon, at Garden Fever, a local nursery that has pulled all products containing neonicotinoids from their shelves. Meet Representative Earl Blumenauer and express your support for the Save the Pollinators Act at the Sabin Neighborhood Bee-Friendly Garden Tour, an event to celebrate bee-friendly gardening with a tour of neighborhood backyards and gardens. It's also a great way to learn more about how to make your yard and garden more friendly to pollinators! Details: Sabin Neighborhood Bee-Friendly Garden Tour. Sun., July 14, 11 am-3 pm. 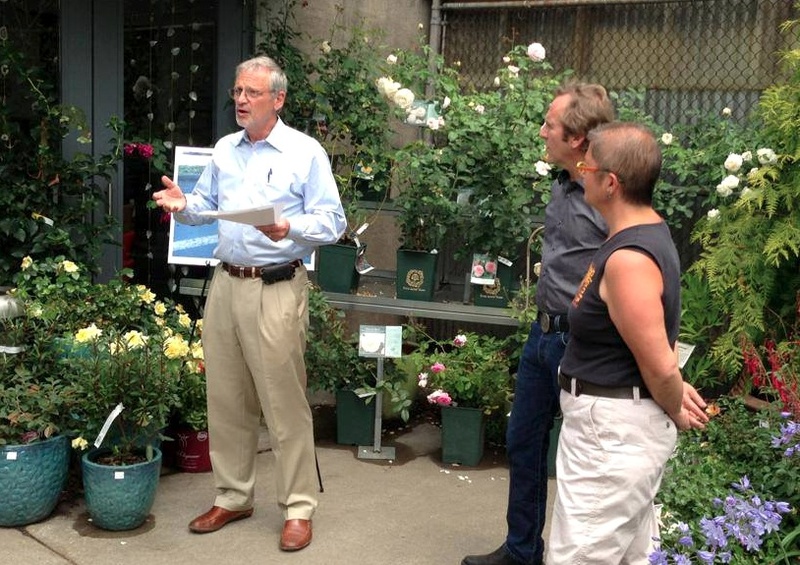 Rep. Blumenauer will kick off the tour at 11:15 am at the garden of Diane Benson, 3926 NE 11th Ave. Call 503-232-6639, ext. 102, for information about the event. More information on the killing of 50,000 bees in Wilsonville. Top photo from the Xerces Society. Bumble bee photo by Motoya Nakamura for The Oregonian. Mushrooms are said to have a "meaty" texture, which is why they are often used as a substitute for beef in hamburgers. 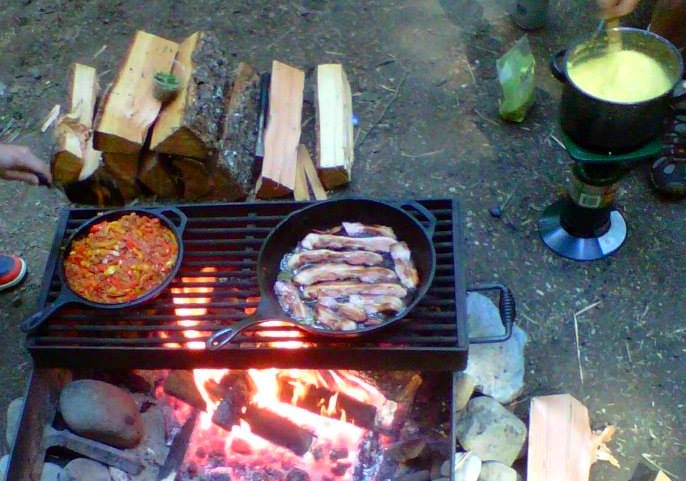 Contributor Jim Dixon of RealGoodFood writes that they can also take on the flavor of bacon when roasted over a (real) wood fire. When the sun is out, I want to cook outside. 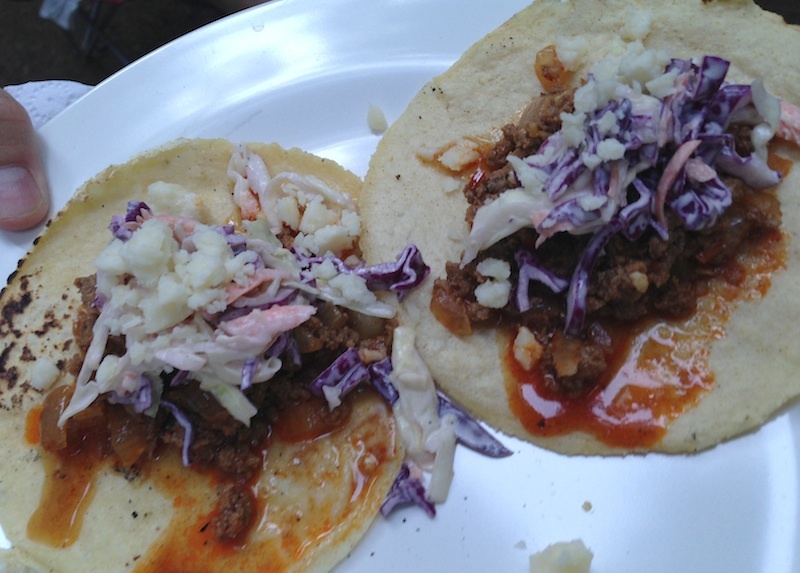 Summer in Portland is just too nice to spend time in the kitchen when I could be in the backyard. So I use my Weber as much as I can. If you don’t have some kind of grill, get a Weber kettle or the generic equivalent (look on Craigslist, they’re cheap). You also need a charcoal chimney (available everywhere) and real wood charcoal, preferably not mesquite, which I think burns too hot; True Value hardware stores or Whole Foods are the most reliable for hardwood charcoal, sometimes called lump fuel. I don’t like gas grills, but they have their advocates. The chef and owner of Cochon and Peche (some of my New Orleans restaurant customers) said it best recently. 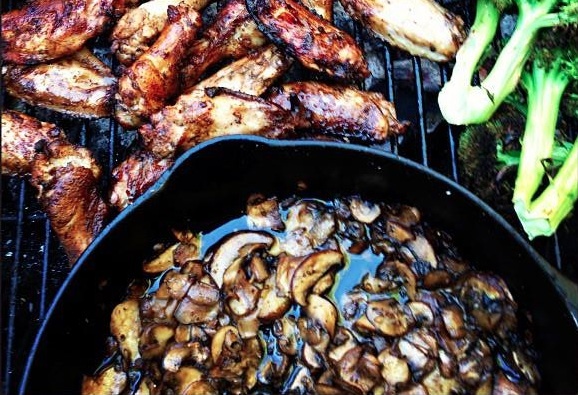 Something along the lines of, “If you have a gas grill, the first thing is to get rid of it.” Gas grills will cook outside, but you can’t get the smoky flavor of a real wood fire, and you need it to make these. You’ll need a covered Weber-like grill to make these, and a cast iron skillet would be best, although any heat proof pan would work; it does need to fit into your grill but only cover about half of it. Thinly slice enough mushrooms to fill the skillet or pan pretty full (they’ll shrink). Drizzle with extra virgin olive oil, add a good amount of good salt (the Sicilian fine sea salt, for example) and some freshly ground pepper. Light some hardwood charcoal in your chimney. When it’s burning, make a pile at one end of your grill so the skillet can sit on the grill grate without being directly over the fire. Did I mention that you’ll also need a chunk of actual hardwood, like the trimmings from a fruit tree (what I use) or a piece of oak? You can buy hardwood chunks for barbecue, and one of those would be fine. 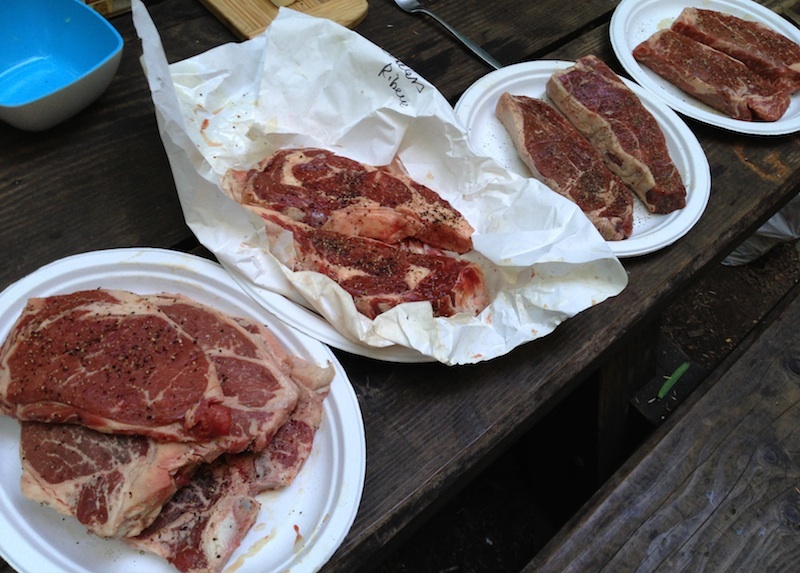 Put it on the grill grate over the fire, and put the skillet of mushrooms at the other side. Cover the grill; within a few minute you should see smoke coming out of the vent on the lid (make sure it’s open). Cook the mushrooms for awhile. Check them every so often to make sure they’re not burning (get an oven mitt; that pan will be hot!). Cook until the mushrooms are shriveled up and a little crispy, maybe an hour, although your time might be vary because every fire is different. Remove the skillet without burning yourself, put it on a heatproof surface to cool a little, and eat the mushrooms like bacon. I rarely, if ever, reprint press releases on GoodStuffNW, but I felt this breaking bulletin from contributor Anthony Boutard of Ayers Creek Farm warranted attention. The Oregon Chapter of the Frikeh Producers' Council (FPC) announced today that mild, dry weather and improved efficiency assured a record frikeh harvest of the highest quality. Harvesting the heads of wheat. Most of us are familiar with grains in their mature, dry state, which allows them to be stored for many years. However, in many places in the world, grains are also enjoyed in their immature (green) state as a seasonal delicacy. Throughout the Middle East, from Egypt to Turkey, immature wheat is harvested, burned and threshed to produce frikeh (frik, firik, freekeh). Erroneously called an "ancient grain," frikeh is actually a way of processing wheat, not a different grain at all. Claims of its ancient status are dubious; what is certain is its delicious flavor. The parched grains of frikeh. The parching of emmer in caldrons was documented in Roman times by Cato the Censor around 200 BC, and in parts of southern Germany, unripe spelt is still treated this way to make grünkern. Frikeh is very different in that it is exposed to an open flame (top photo). 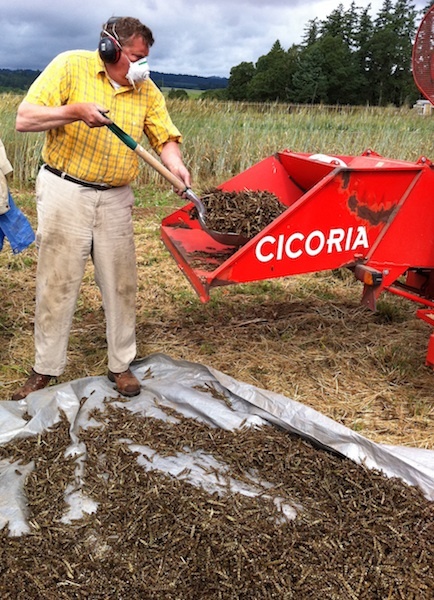 There is scant documentation of this method of preparing wheat, most of it from the last 50 years. Some authors have speculated that it was originally produced using barley straw, but that makes no sense as the straw's flame is not hot enough. Anyway, the straw was very valuable as bedding and packing material, and would not be wasted burning wheat. Possibly small branches from orchard and olive groves were used. Like our fellow frikeh makers in the Middle East today, we use propane torches, which are easier and safer to use. Feeding parched grain into the thresher. The harvest of frikeh is done during the brief interval between the “milk stage” when the endosperm is still liquid and the “soft dough” stage when the endosperm is solidifying. Too early and the grains shrivel; too late and the grains are no longer dark green and develop a starch quality. Frikeh of the best character is produced during a three-day window in the ripening process. 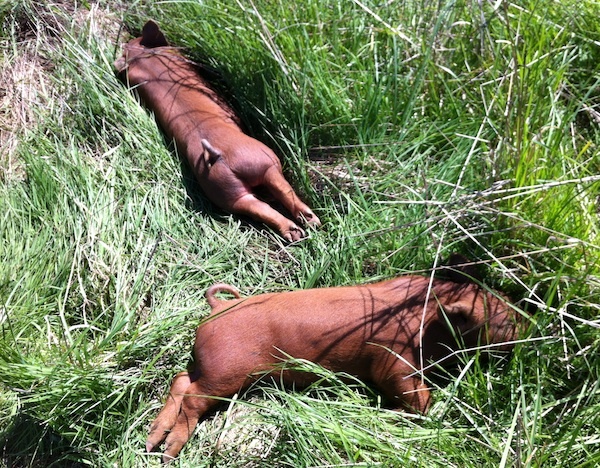 The wheat is cut, the sheaves are stacked on corrugated metal and the heads are lightly roasted. In addition to imparting a smoky flavor to the grain, the heating also stops the maturation of the endosperm. The sweet fragrance of the roasting wheat wafts through the valley. 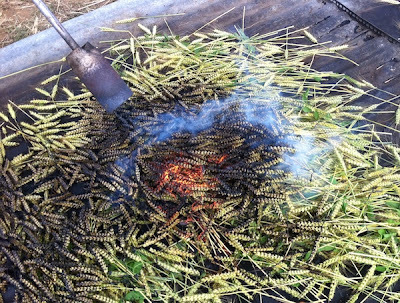 The charred heads are then fed into a thresher to separate out the grain. 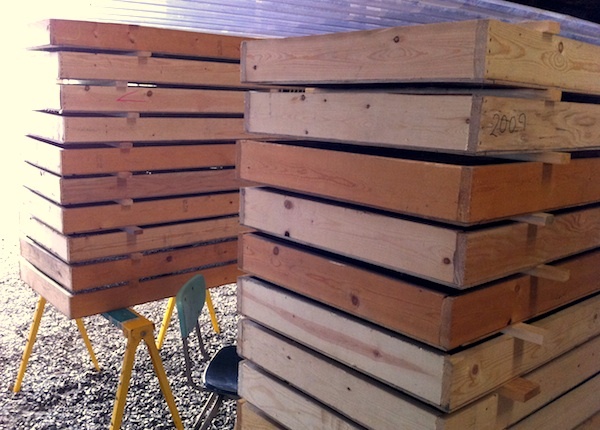 The grain is cleaned and then dried on shallow trays. The finished frikeh is rinsed a couple of times and cooked for approximately an hour. Any remaining chaff and stems should be skimmed off during the rinsing or cooking. Frikeh may be used in any recipe that uses rice or bulgar wheat. It is traditionally served with lamb or chicken. The smoky, nutty quality of the grain adds a unique dimension to vegetarian dishes. The simplest is as a tabbouleh style salad, perfumed with lemon and mint. 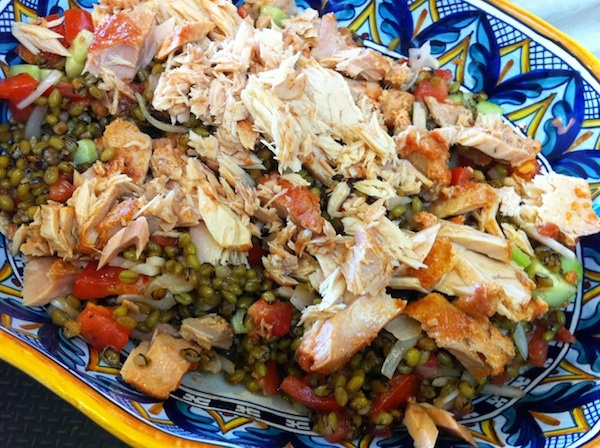 A frikeh salad with albacore. FPC spokesperson Carol Boutard notes that frikeh has different nutritional qualities than mature wheat. It is higher in minerals, especially potassium, calcium, iron and zinc, higher in dietary fiber and low in phytic acid. You can find frikeh at the Ayers Creek Farm stand at the Hillsdale Farmers' Market on Sundays from 10 am to 2 pm. Don't delay, though…it'll only be available for the next couple of weeks. 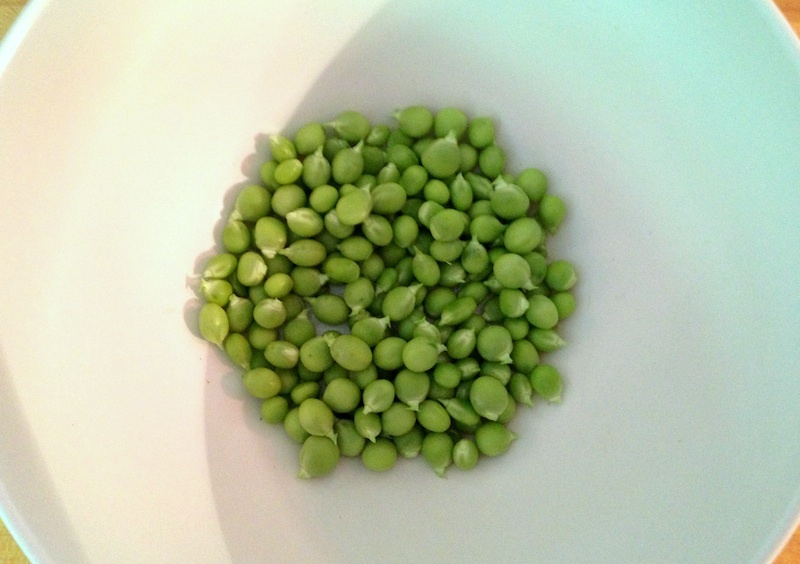 The first peas of the season…the tiniest of tastes, maybe a quarter of a cup, but these little sweeties are the equivalent of gold, at least to me. I could pop them into the freezer, then collect their brethren and eventually have enough for a soup or pasta dish. But right now it's enough to ponder blanching this little pile and popping them into my mouth for a burst of green joy. 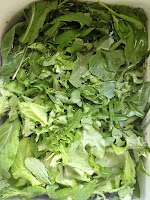 There have also been the first few harvests of salad greens and radishes from our little plot, which have come in handy with the hot days we had this last week. One dinner was chopped shrimp, olives, hard-boiled eggs and greens tossed in a bowl, lightly dressed and accompanied by thick slices of Dave's bread and glasses of rosé in the back yard. Another was grilled steak with a pesto of radish greens with a simple salad, a perfect warm summer night's meal. 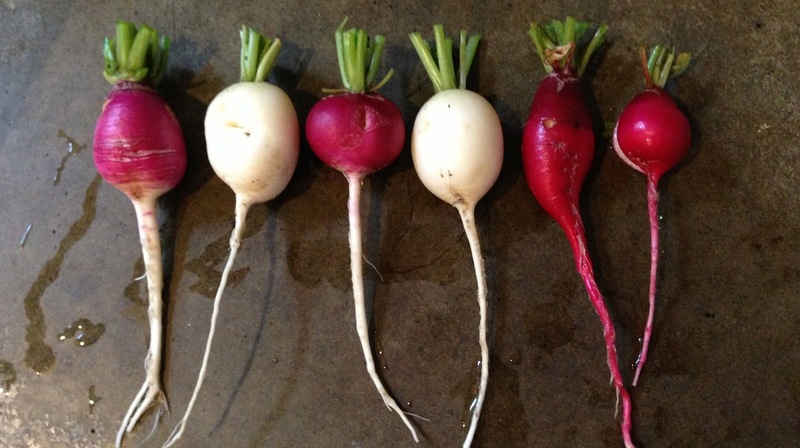 Radishes, all shapes and sizes. The tomatoes, which have been waiting patiently for some heat so they can finally start growing, are showing signs of life with a few blossoms and tiny fruit being set. The beans, carrots and basil are also relieved to see the sun, and are stretching out their new leaves to get as much of it as possible. Altogether a promising start to the summer.